A few month ago, a Jollibee branch near our place had a special promo. A free Jollibee Champ after 3 consecutive drive-thru purchase with a single receipt of 150 pesos. Every Saturday hubby and I love to buy snacks at Jollibee and for the entire duration of the promo we have claimed two Champs. I never had the chance to take a picture of my first Champ because I forgot. On my second visit to the store to claim my second Champ, I forgot to bring my camera. I just used my cellphone in taking pictures of my FREE Champ. I took this inside the car while waiting for hubby getting some cash on the ATM. I told him I would spare half of it for him but when he came back he was surprised to see almost one-fourth as his share. LOL! Anyway, I am just thankful for freebies like these. I hope there’s more to come! Wow, that is a very cool promo! Kapag dito sa Manila yan, baka malugi na si Jollibee. Hehe. Visiting via FTF. I like me some burger. waaaa ang tsama ni wifey, buti natirhan pa si hubby hahahaha. 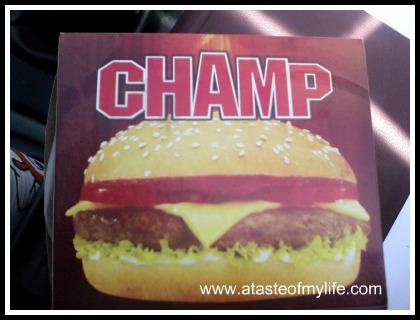 I love Champ kaya lang mahal hehe. 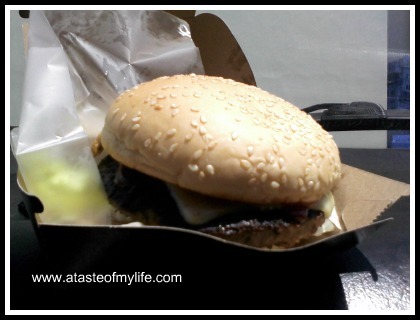 I am also a big burger fan! Was here and seems like I’m too early for Yummy Sunday.will be back later.